Speed is the word for Guinness Rishi as he powers his way through a giant 490 gram bottle of ketchup in just 39 seconds. 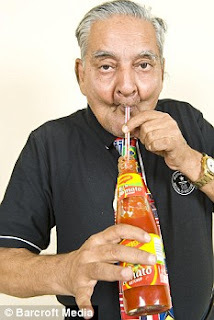 Guinness believes he holds the fastest time for drinking the world's favourite condiment, which he sups through a straw. Guinness puts his motivation down to the need to stand out in a country of over 1 billion people. 'People consider me an extraordinary person, not an ordinary person,' he said. His records include 'taking on the world's oldest adoptee', after he legally took custody of his 61-year-old brother-in-law. Guiness also built the tallest sugar cube tower in the world, which stands at 64 inches. He took his new name in 1991, after keeping a motor scooter in continuous motion for 1,001 hours for another bizarre record. 'Persons who have no money wish to do something in their lives, so the poor people try to break records by their strength or their will,' said Guinness, who is joint owner of an auto-parts factory. The ketchup-crazed pensioner said he will continue to find new records to break until he achieves his dream of official recognition. 'I hope to make my family proud,' he said. First all I ended up thinking of was "ewww; that's really kind of gross." Secondly I was confused that you could legally adopt a 61 year old. But then my thoughts went back to Slumdog Millionaire, which I saw last week while visiting a friend (who somehow already has it bootleg, which worked out well because it was snowing in New York) and how, admittedly in the immediate afterglow, I had perhaps hyperbolically declared that I wouldn't call it the best movie I've ever seen but that I'm not sure I've seen one better and about how this reminded me of it. I guess in the way that it was a story of "Persons who have no money wish to do something in their lives" and how they've both ended up getting their dreams; after all Rishi was featured in an international publication, which isn't too shabby for a guy who pretty much just drinks ketchup fast. It's a pretty universal story, though if he were black he'd totally have to be drinking hot sauce...I' wonder how hot sauce would taste on ice cream...i'm a teensy bit obsessed.